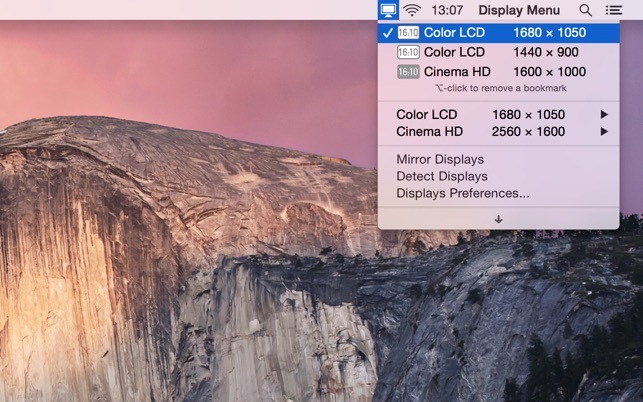 Display Menu shows a status item in your menu bar that lets you change your display settings with a single click. 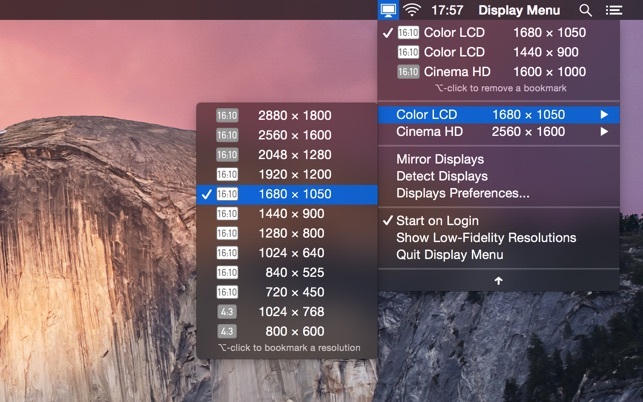 Depending on your display setup, you can set the screen resolution, toggle mirroring, and adjust the refresh rates. 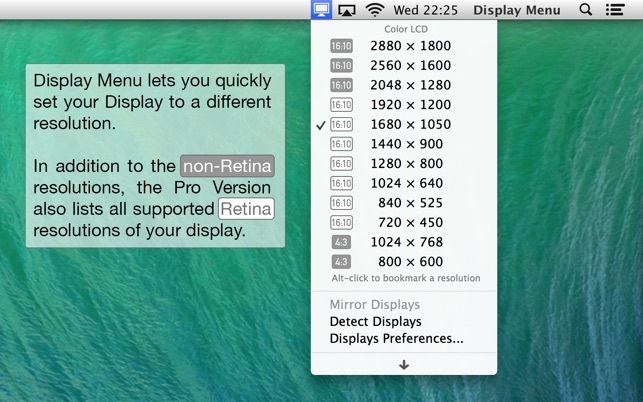 You can enable additional features like Retina resolutions (on Retina Displays), AppleScript support, and resolution bookmarks as a paid upgrade. Version 2.2.3 added access to our FAQ to Display Menu and fixed some minor issues. If you have feature requests or if you find any bugs, please report them to us via our website or Twitter @DisplayMenu. If you happen to like Display Menu, please leave a positive review on the App Store! 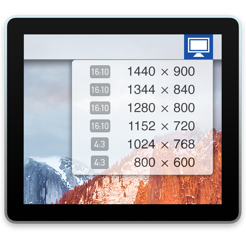 With version 2.0 we have added a number of great new features to our Display Menu software! From the large collection of emails we have received from you over the last year, we have distilled the three most wanted and, hopefully, most useful bits of added functionality and implemented them. While we are pretty happy how the new features have turned out, it was still a lot of work: apart from solving a number of technical difficulties, we went through a long design process to include the new functionality but, at the same time, keep Display Menu's UI streamlined and uncluttered. This is also the reason why we decided to bundle the *new* features only with the new 'Pro' version of Display Menu. The basic free version of version 2.0 still contains all the features from version 1.4; the Pro version is a paid upgrade that you can purchase from within the App. I was installing a new Mac in an auditorium this weekend to be connected to an existing projector with a 100 foot VGA cable. We have to use a VGA amplifier to get a high quality signal. That amplifier prevented the Mac Mini from seeing the projector resolution info. My only choice was to use a 1280 x 1024 resolution that was the wrong aspect ratio. I was wondering If I needed to install a new cable, or use a different projector. With no time or money to do either, I tried this $2 app. It worked flawlessly! Just a click from the menu bar I can set the resolution to whatever I want it to be. I cannot imagine what I would have had to do without this app. I bought another copy for my personal Mac. I will do all by display res switching from this little app from now on. I purchased the pro version. If you need this app, it is well worth $2. I did not try using just the free version. I rated it 5 starts. I would have given it 10 stars if I could have. Thank you the developers for a great little app that just works! This is *just* what the doctor ordered. I need to take non-Retina screenshots on my MBP (scaling won’t do), and the free version of this enabled the full resolution without a fuss, and I didn’t even have to disable System Integrity Protection! I almost instantly upgraded to the Pro version, mostly because without it you can’t use the menu to go back to the “native” Retina resolutions offered by Mac OS X, although you can go back to it in display preferences. This is a little unclear in the documentation, but shouldn’t be a deal killer for you if you’re contemplating the free version. However as an app developer myself, I need to go back and forth all the time and so the upgrade was worth it. Actually the upgrade offers bookmarks, too. Now I’ve got the two resolutions I most need: native from non-Retina screenshots, and and my preferred “More Space” Retina resolution. I’ve not tried the AppleScript yet, but assuming it works I won’t come back and deduct a star. Trying this feature actually kind of excites me because I use AppleScript within my own apps to take the screenshots, and so switching resolution in my existing screenshot script is just another added bonus. I’m REALLY glad I found this app. No more having to VPN into one of my Mac minis in order to take non-Retina screen shots. I paid for the pro version of this program. This program hasn’t been updated in a long time. It used to work flawlessly. Now I find that it has issues. Basically, I had the resolution cranked up on my MacBook Pro 13”, and my eyes starting getting worse, so I’ve decided to bring the resolution down a little bit. Unfortunately, sometimes the computer doesn’t remember what resolution I want to stay at (1680x1050). It sometimes defaults to a higher resolution which screws up all of my windows and then I have to reposition and resize everything. I’ve written to the developer 4 times with no replies. Judging from the fact that it hasn’t been updated in more than a year and they don’t reply, I would say use this program at your own risk.